Settlers nearly destroyed Michigan’s wild rice beds. Native tribes are restoring them. Barbara Barton and Roger LaBine navigate a large wild rice bed on Tawas Lake. Stateside's conversation with Roger LaBine, member of the Lac Vieux Desert Band of Lake Superior Chippewa, and Barbara Barton, endangered species biologist and author. 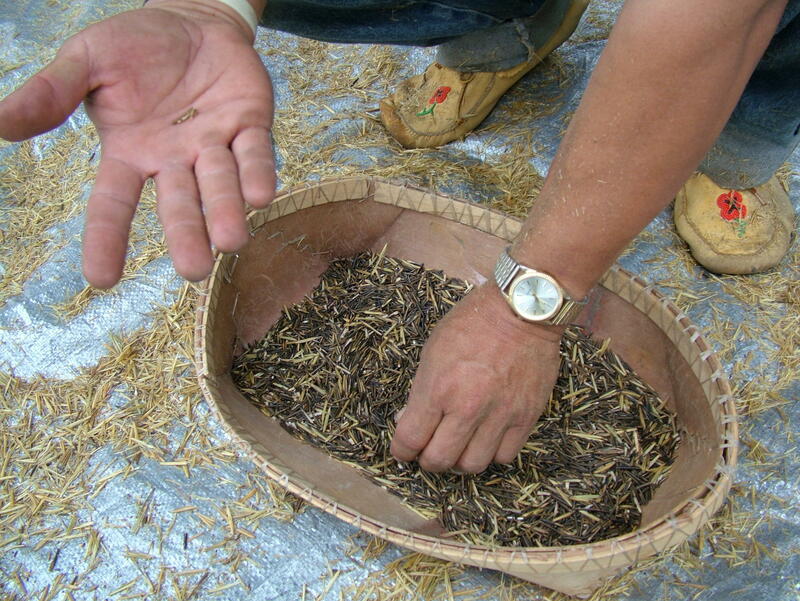 There is a rich tradition of wild rice in our state, especially for Michigan's first people. The plant plays a big role in the culture of Anishinaabe tribes, who call it manoomin. Vast rice beds used to sit at the mouths of Michigan’s rivers. Some were thousands of acres in size. When European settlers arrived, they nearly destroyed the resource. Now only one large bed remains in Michigan, but there is work afoot to restore and protect wild rice. Roger LaBine is a member of the Lac Vieux Desert Band of Lake Superior Chippewa Indians. Barbara Barton is an endangered species biologist and author of Manoomin: The Story of Wild Rice in Michigan. The two joined Stateside’s Cynthia Canty to discuss the history of wild rice. Barton says wild rice has likely grown in Michigan for thousands of years. Up until 10 years ago, Barton, a career biologist, didn't even know wild rice grew in Michigan. “Most non-tribal people don’t know that wild rice grows wild here. It's not farmed, it's not an agricultural crop here, it's wild,” Barton said. According to Barton, European settlers regarded the rice beds as a nuisance to travel. In the 1800s, the Army Corp of Engineers dredged rivers in an effort to ease transportation. This spurred development and pollution along the shorelines, which led to the destruction of wild rice beds. LaBine adds that this was all happening during a time the U.S. government was trying to assimilate Native Americans and force them onto reservations. “The importance of manoomin is just as important as trying to maintain our language. So we need to bring and maintain and keep that manoomin here because this is the only place on Mother Earth that it grows," said LaBine. Listen above to hear Barton and LaBine discuss some of the restoration efforts and the progress they have made in restoring wild rice in Michigan. Audio: A conversation with Matthew Fletcher, professor of law and director of the Indigenous Law and Policy Center at Michigan State University. This week, the U.S. Supreme Court released a decision that could strengthen the fishing rights of Native American tribes across the nation. It could even give tribes in the Great Lakes region a legal framework to shut down Enbridge's Line 5 pipelines. Stateside's conversation with Brett Hartl, governmental director for the Center for Biological Diversity. A recent proposal by the Trump administration could mean big changes for the Endangered Species Act. That law was passed some 40 years ago. It was designed to keep endangered plant and animal species from going extinct.